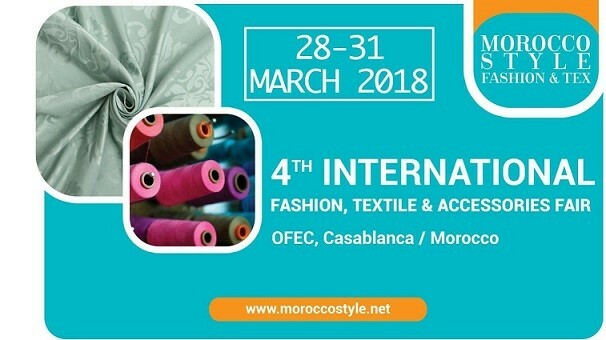 Morocco Style – 4th International Fashion, Textile and Accessories Fair opens its gates to thousands of professional visitors on 28 – 31 March 2018 at OFEC, La Foire Internationale de Casablanca. Morocco Style is an irreproachable opportunity for fashion, textile, accessories, ready-to-wear professionals: Importers, exporters, manufacturers and distributors to weave B2B relationships in this sector which is in constant evolution. This unique fair is organizing by Pyramids Group and co-organizing by AMITH and with the partnership of Atelier Vita. This fair is seen as a platform for exchange not only at national level but also on an international scale. The 2017 edition was attended by over 300 exhibitors who presented the latest trends in fashion and textiles. The show also recorded the participation 12.443 visitors and 11 countries. With the remarkable success of the last edition Morocco Style 2018 will be attended by over 350 exhibitors from 7 countries: Morocco, Turkey, China, Pakistan, Taiwan, Portugal, Germany; also it is expected to have 15,000 trade visitors from Morocco and 32 foreign countries from West Africa, North Africa, the Middle East, the Gulf and Europe. This platform enables national and international companies from different industrial sectors to show and promote their skills, to meet partners and to discover the new trends and techniques of the sector. Morocco Style also contributes to the development of Moroccan expertise in the textile sector by consolidating Morocco’s competitiveness and making Morocco an international reference and an African regional hub of the sector. The opening ceremony will be held on Friday, 28 March at 16:00 at the Casablanca International Fair in the presence of several national and international personalities, export councils and federations. Ambassadors of pavilion countries will give honor to our events.